We saw some amazing exhitibition shots from Trump after crossing the winning line. I agree what BBC commentary said yesterday, we can see some shawdon of Jimmy White on Judd. Judd played many crazy shots or some shots that elder players would not choose, Ding definitely wants to stop him today. Trump does not have very good cueball control and do poorly in safety. 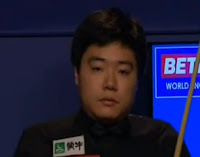 Ding should put more safety into his game to score more frames. A rematch of 2010 UK Championship Final. At that time, Higgins beats Williams 10-9 cameback from 5-6. Williams would like to take revenge of it ;-) Williams wins the first frames before Higgins takes the following with 135. Williams leads 3-1 up on Higgins before mid session. 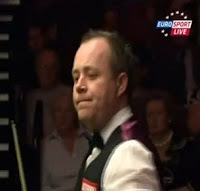 After mid session, Higgins levels the match with 127, 3-3. Williams wins the last two frames of the session with 74. Mark Williams holds a 5-3 lead, two frames advantage over John Higgins. There are a lot of tight frames in this session, more safety battle is played. Although John contributed two centuries in the session but he is 3-5 behind Williams. Both players do not get use to play on the new table. I wish they can raise their performance tomorrow.